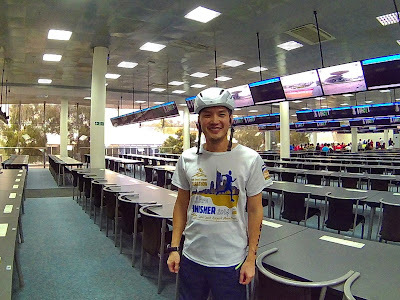 I found out about this event just a mere 6 days before the race day, quickly I gave both of them some convincing session but unfortunately Foo could not join us promising his girl for a movie night out. With only me and Zijill signing up for the race, we met up at our agreed meeting point that evening and head to the race venue together with the skies ready to pour. Upon arriving the Sepang International Circuit (SIC), we can hear race cars roaring around the 5.5 km circuit and little did we know there was a car race event on the same day too. Without thinking too much about it, we picked up our race pack in one for the paddock with volunteer helping us on the body marking. It was hassle free and smooth as a breeze, kudos to the organizer on that. We then head back to our car preparing our war machine (hehe bike I mean), bike number sticker up, break checked and we are all ready to rack up our bikes at the transition area before race briefing. As if racing in a duathlon event is not challenging enough, some one up there just decided to throw in more dark clouds hovering over SIC and looks like we are in for a wet race. Shortly after racking up our bike at the transition area, it started to pour; some decided to push the bike to a covered area keeping everything dry while I decided to just bring along my helmet and let the bike play with the rain a little. 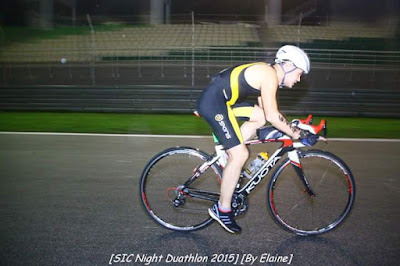 With experience in both duathlon and triathlon race before, I still find the race briefing not to be missed especially on the 2 transition flow from run to bike and from bike to run. The briefing finished on time, with a round of Q&A with 3 of the sports elite sharing their training program and what inspired them in the sports. By then the rain has stopped, a very cooling night for the race. While waiting for the youth category to start at 7:30 pm, we walked down the pit area to the start-finishing chute and along with it; a rare opportunity to watch race car engineer working on the race car inside the designated garage. It was all cool!! The youth category started at about 7:40pm, with Harry (Former Youth Ironman Champ) chasing them down giving the youth participants a 5 mins head start. As the youth race distance is half the race distance of the main race, it wasn't long the first runner completing the run leg and head out to the bike leg and boy they were really fast. While watching the race unfold, we saw some race lollipop lying around the pit wall and we starts goofing around at the pit wall taking photos with the lollipop. That said, we did observed a few mistake a number of participant made and I suspect they skipped the race briefing missing out some important information coming in for the last run leg. Soon after, we saw Harry sprinting neck to neck to the finishing line with the youth. Finishing 1st 5km run without much problem, we head to transition 1 getting ourselves ready for the 22.5km bike around the beautiful circuit. Zijill being a new comer, I told her to take her time getting things ready, drinking enough water before heading out. With no cleats to mount, we started with the bike easy and just paddle on down the pit exit to the track. Immediately, the cool breeze was flowing through as we negotiating through a down hill turn 1 and 2 before going to a slight incline towards turn 4 with a very conservative pace. As she was struggling up the hill, I shouted out to her to change gears for the climb but she didn't want to as she was worried that the shifting will not work and the chain could fall off LOL.. don't laugh, it was possible since her bike was a 15 year old with many parts of the bike parts visibly rusted to the bone. I then decided to shift down a gear or two instead of pushing her saving the legs for the run later. The rhythm of the rain starts picking up and we have to slow ourselves down further as the track is very slippery by the time we completed the 1st loop. Nevertheless, there were riders still flying around the circuit while we are turtle-ing the remaining 3 loops. Without any incident, we were glad that we have completed the 4 loops of bike on the wet and slippery track heading for the last leg of the race with a remaining 5 km run. 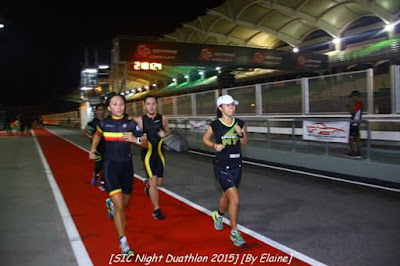 The night race was very well organized to say the least, facilities was great, water station was strategically placed at every 2.5km run route offering water and isotonic drinks. Kudos and a big thanks to all the volunteers who stayed out under the rain shouting out their support and making sure things are fine for all of us. 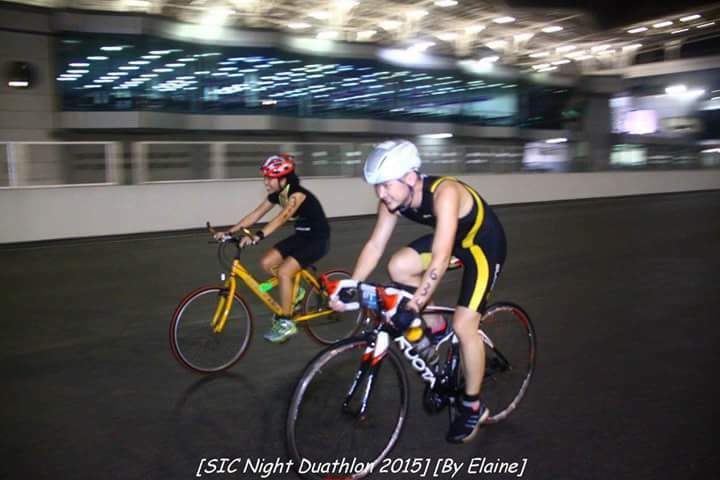 However, the race track was not light-up sufficiently, part of the race track was dark or at least the organizer could have inform participants to come with head lights or bike lamp for safety reason. Other than that, I had an enjoyable experience cycling around the beautiful race track. I would definitely give it another go next year.